Humility is considered a virtue and the fact that the author has to “brag” about her accomplishments in order to “promote” herself makes her rather…Khanflicted. Now that she has given that disclaimer, she feels more comfortable publishing the following paragraphs. Samia Khan is a multi-hyphenate content creator and recovering journalist/personality/interviewer who spent more than 3 years working for FOX (yes, as in News – see why she’s Khanflicted?) as a digital anchor for FOX News Now in Phoenix, Arizona. Aside from providing on-air commentary on a daily basis for three years and anchoring digital broadcasts that were viewed by thousands (and sometimes millions, depending on the day), Samia also performed stand-up comedy in Phoenix as an outlet to share her unfiltered point of view. After years of being asked “What’s THAT like?” (no one ever wanted to explicitly say “a kinda-Muslimish-person working for FOX…in Arizona?!? 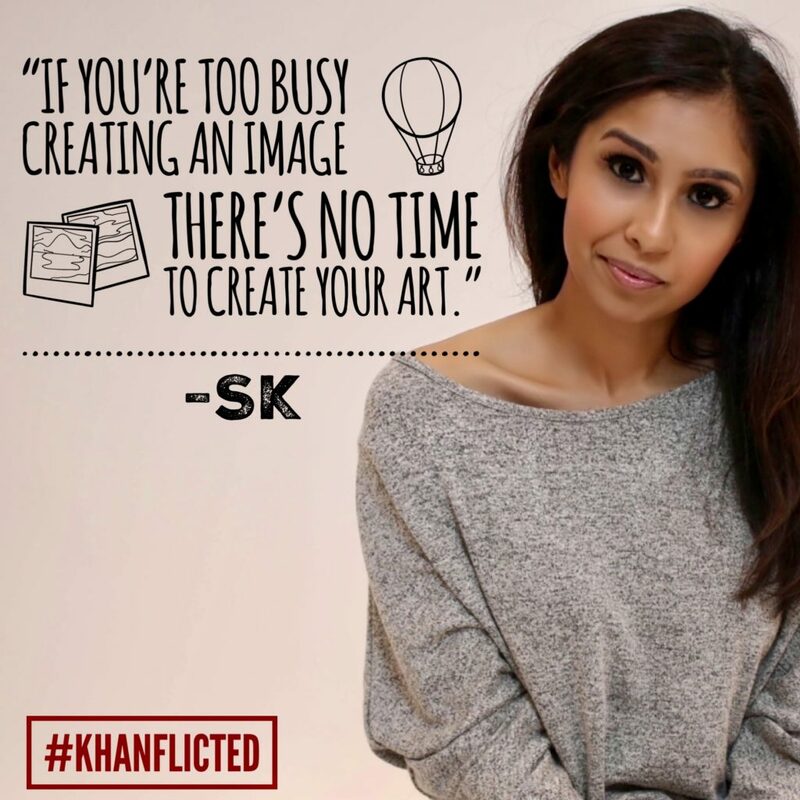 ), Samia took it upon herself to write her perspective into comedy material which in turn influenced the creation of her scripted show, Khanflicted – a series that follows a 28-year-old, indecisive but well-meaning, Pakistani-American girl who abruptly moves to Arizona to escape her haunted life in LA. In addition to the pilot, Samia is working on an autobiographical, memoiristic collection of comedic essays from the point-of-view of a Pakistani-American millennial who has been conflicted (I mean, Khanflicted) her entire life – from not fitting in with her white classmates in Fresno, CA as a kid, to being told she’s “not Muslim enough” by her then-boyfriend as an adult. (She’s even Khanflicted over referring to herself as Pakistani-American, considering technically, she’s also half-Indian.) A book that reflects on identity, gender and self-worth, she uses humor to examine the painful moments in life. Prior to taking the job at FOX, Samia was in LA creating and developing comedic content. In 2013 she co-created #Instacurity, a webseries and “movement” that satirically examined society’s obsession and dependence on social media and the validation that comes with likes and followers. She wrote, produced and starred in more than a dozen sketch videos. The series was featured by TIME, Mashable and Good Morning America, among others. She has also worked as an entertainment reporter/producer for the TV Guide Network (it was then that she launched Khanversations as a blog to humorously document her celebrity encounters), as a host for a tech show on Revision3 (now Discovery Digital Networks) and as an on-air contributor to The Young Turks and other digital outlets (both video and podcast) before shifting her focus away from simply to presenting information to taking a more hands-on approach to the creative process. A graduate of the University of Southern California, Samia was selected as an Annenberg scholar and awarded an academic scholarship that gave her the opportunity to pursue a Bachelors degree in Broadcast Journalism. She also completed long-form improv training at the Upright Citizens Brigade in Hollywood, studied sitcom writing at UCLA and took acting classes at both Scott Sedita and Margie Haber’s studios.